GALA BENT WAS ONCE a landscape painter who lived in Indiana, born and raised in the Midwest. Her paintings, acrylic on paper, featured dark, heavy, and flat horizontal spaces. But she used to dream about mountains. That is, until she found herself surrounded by them. When she and her husband, fellow artist Zack Bent, moved to Seattle in 2006, Gala found herself sandwiched between the Olympic and Cascade Ranges, with Mount Rainier looming overhead. Around this time, Gala began to feel like something was off in her approach to painting. Maybe it was the new landscape that threw her off, she thought. She had entered a world of mountains, rivers, mist, and rain, a watery landscape where earth, sky, and ocean all meet—yet a world that is not empty of people, but inhabited. A wild and not-wild place. It was an offhand remark from Zack that got Gala thinking about a new approach to the page. So she began to draw. Over the past several years, she has found that working in gouache (opaque watercolor) and graphite on paper has freed her from those dark, flat spaces to consider lighter and airier forms. Dense, 300-pound Arches paper soaks up water-soluble pigment to suggest light-filled spaces. Her gouache technique makes use of the full range of the medium’s possibilities. Misty, watery washes reminiscent of a rain-soaked Northwest sky appear in the drawings’ backgrounds—one wash was so faint that a collector, thinking the purchased drawing was water-damaged, sent it back. But Bent also uses bold, bright layers of the opaque gouache pigments to make a statement. The same medium can create both a runny, watery background and a jewel-like faceted miniature form. Detached from a grid or horizon, shapes in the foreground often float, tied neither to the laws of gravity or to the page’s shape. “I’ve always loved and hated the rectangle,” she says. Though her drawings are rarely taken directly from life, Bent remembers that one of her first powerful experiences with art-making happened when attempting to reproduce an image from life. Her eighth-grade art teacher used Drawing on the Right Side of the Brain, a textbook designed to train the eye to see past preconceived notions to what is actually there. In a class exercise, Bent found herself completely absorbed in the act of drawing. As a young artist she resisted the idea of “doing anything practical” with her artistic skills—graphic designer, architect, medical illustrator. Instead, she spent hours with a massive volume on the history of painting that belonged to her dad, looking, copying and looking again (Brueghel was a big favorite). Now, although she does take on commercial illustration work—a book on biochemistry, a phlebotomy textbook, album art for Asthmatic Kitty Records—she remains rooted in the practice of fine art. The CityArts blog also published a 1998 photo that Gala calls “one of our first collaborations.” A black-and-white, off-center image shows the two in silhouette, almost kissing—except that Gala’s eyes are wide open and she’s biting Zack’s lip. A familiar, intimate moment is destabilized, provoking a second look. Intimate, destabilized moments happen frequently in Zack’s work. He uses video, photography, and found objects to create narrative installations, many of which, recently, take his family as a subject. In 2008, when Zack had a one-week residency in now-defunct Crawl Space Gallery, he built a patchwork-quilt-covered wagon and invited the family to “homestead” in the gallery as a sort of living meditation on their cross-country move. This was their closest collaboration, Gala says, especially since their small boys’ activities became a part of the exhibit, and Zack needed Gala’s help with caring for them in the midst of the art installation/performance. In his 2009 show, Buffalo Trace, Zack photographed Gala wearing an awkwardly fitted, pseudo-boy-scout uniform while she was very pregnant with their third child. “It became pretty collaborative, even though he was definitely the art director and had the primary ideas,” she says. Even if Zack isn’t putting brush to paper in Gala’s drawings, she calls him her “main critic,” a key figure in her art-making process. “He knows the whole breadth of my work, he knows contemporary art, he knows what my tricks are that I fall back on—he can kind of see through them,” she said. Often, when she sets up to draw, one of their three boys will pull out his art supplies and join her. Integrated as her art life and family life are, she hasn’t found that she’s wanted to make family the subject of her work—especially when her children were very young. She relished the separate mental and spiritual space that art-making provided, in the midst of ordinary family chaos. PLATE 8. Gala Bent. Readers in Tandem, 2009. Gouache and graphite on paper. 22 x 30 inches. All images courtesy of G. Gibson Gallery. 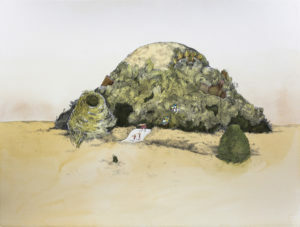 Even so, many of her pieces, especially those she created and exhibited between 2008 and 2010, call to mind the playful weirdness of certain children’s book illustrators, particularly Maurice Sendak. Readers in Tandem, in which two composite beasts peek out from behind wild hair to peruse books, is characteristic of this [see Plate 8]. A delicate braid connects the two. Bent blends earthly, bodily figures with crystal-like geometric constructions. When she created Readers in Tandem, she was thinking about “what it means to come from a text-based faith”—a mix of Protestant Christian traditions, in her case. “There’s often a sense of community in reading the same texts, but there’s also extraordinary division that comes from reading and interpreting the same texts,” she says. 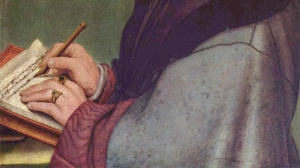 The slender braid that connects the two readers is weighted with possibility. Are the twin readers on the same page, joined by what they find? Or is their frayed connection about to snap? The moment is in-between, a movement captured. Bodies are always in motion in Bent’s drawings, which make frequent use of animal-like figures that, while never quite realistic, seem physically plausible. Natural forms and the organic textures of hair, skin, and water weave in and through geometric shapes that seem to hail from the world of abstract ideas. If an animal body could touch the ideas it had about itself, it might be pictured this way. Though her work takes a keen interest in the natural world, Bent is not tied to the literal landscape, as it might be photographed or painted in plein air. Instead, she’s interested in the way nature sticks in the mind that perceives it, transformed by memory and imagination. She has in mind the painters of the Song dynasty (960–1279), who brought to life their interior landscapes, visions that were gleaned from time outdoors, but refined in the mind. “As soon as I draw something from life, or I pick something from a visual source, it feels like a visual collage to me,” she says. “I can see a rift between the thing that is taken from a photograph and the things that are more intuited.” Her process of drawing not from life gets rid of those rifts, and makes it seamless. Perhaps unusually for someone whose “main critic” is an art photographer, she has made a conscious effort not to work from photographs in her own drawings. She draws from life in her sketchbooks, but in the studio she prefers to draw without direct reference to source material. PLATE 9. Gala Bent. 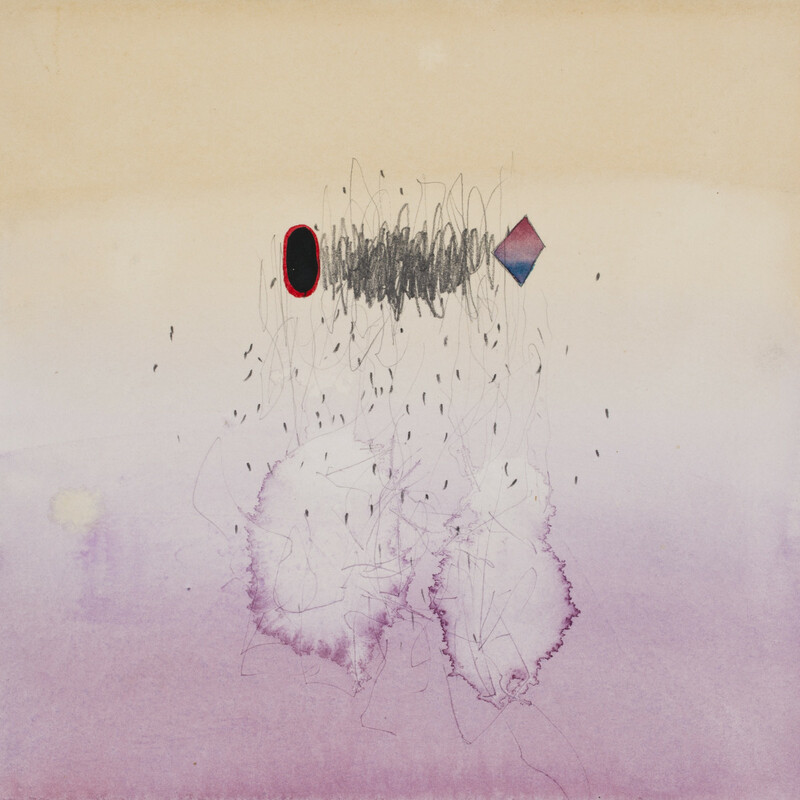 Watcher, 2010. Gouache and graphite on paper. 22 x 30 inches. Each of Bent’s recent shows at Seattle’s G. Gibson Gallery, which represents her, has used a visual trope to offer variations on a theme from nature. This happened most directly in her 2010 show O Mountain, which she says was her way of understanding what it means to live in the shadow of Mount Rainier. Frequently swathed in clouds and thus invisible from the city of Seattle, the mountain, when it does appear in the distance, seems almost a figment of the city’s imagination. Bent’s drawings capture this imaginary quality. In Watcher, ethereal figures drift on a path into the dark heart of the mountain, suggesting a wild and sinister presence there. Buffeted by a wind or some unseen force, the hiking figures are hairy and frail, in danger of being consumed by whatever lives in the mountain [see Plate 9]. Perhaps some sort of troll or fairy-tale goblin has taken up its residence there. Or perhaps the solitary mountain—like Olympus, Sinai, Fuji, or Rainier itself—cloaks the presence of some unknown divine being. PLATE 10. Gala Bent. Matriarch, 2012. Watercolor and graphite on paper. 15¼ x 9 inches. Modernist poet Marianne Moore, who visited Mount Rainier in 1922, probably would have voted for the latter. Her long poem “An Octopus,” which compares the Nisqually glacier to “An Octopus / of ice. Deceptively reserved and flat…” weaves travel brochure quotations with references to Olympian deities to create a surreal pastiche of textual bewilderment. Looking at Bent’s drawing, I was reminded of Moore’s sprawling, intricate poem that sets out to capture the mountain’s sublimity, knowing all the while that sublimity can’t be contained. The interior landscape, then, is a place where the natural world can become re-enchanted, or re-populated with the spirit. The version of Mount Rainier that exists in our minds may be the abode of some divine being, remotely watching our small human travails, but our presence on the mountain means we are also uncomfortably close to whatever it is. It’s sublime and divine. It’s the mysterious other that haunts our existence. Following O Mountain, Bent’s show Geology of Longing (2012) took on more vertical forms, many of which are intricately drawn amalgamations of natural textures. These forms have roughly the proportions of hunched human figures, which makes them seem as though they are about to shapeshift. In creating this show, Bent spent a lot of time looking at Chinese scholars’ rocks—natural geological formations that have been taken out of context and set apart as objects for spiritual contemplation. A rock is often placed on a carved wooden pedestal designed specifically for it, so that an artificial object becomes the home for a natural object. 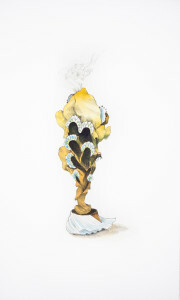 In Matriarch, overtly feminine, frilly forms bloom out of a stalagmite-like geological form [see Plate 10]. The frills look a bit like floral kokoshniks, the tiara-like headdresses of Russian folk costumes, suggesting that the dark spaces below them are lost faces, a mysterious geology and genealogy of absent ancestresses. The blank spaces invite us to imagine generations past, even while forcing us to admit how little we know of their lives. Faceless, they are free of personality, but not devoid of life. PLATE 12. Gala Bent. (Over)reactive Volcano 2013. Gouache, ink, and graphite on paper. 22 x 30 inches. In “reacquainting myself with the language of chemistry,” she says, “I started researching carbon as an element.” Carbon is in the graphite of the pencils she uses to draw. But it’s also in our bodies: “We are carbon-based life forms.” Large drawings in the show included Flowering Fossil Bed, a dizzyingly intricate bell jar of geological specimens that, faintly resembling crocheted flowers, might be a prized possession in some dream-world wunderkammer [see Plate 11]. 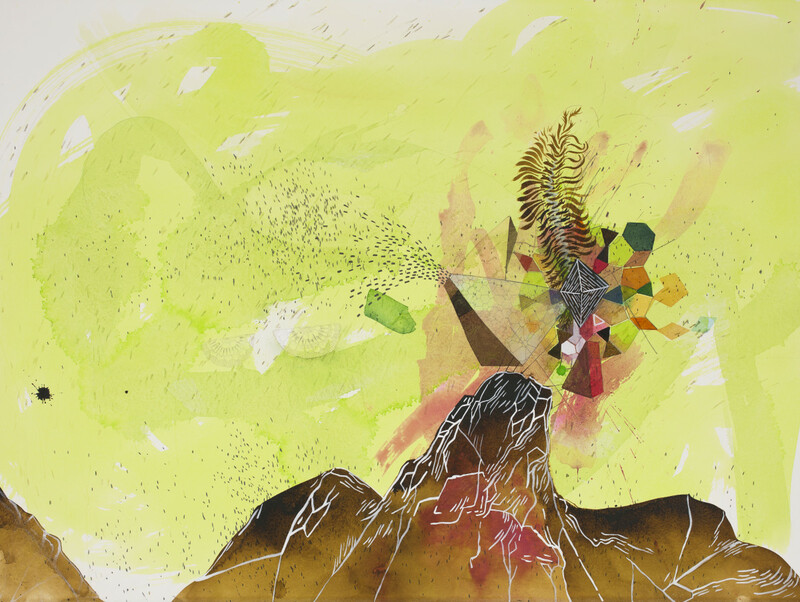 (Over)reactive Volcano, from the same show, is all motion [see Plate 12]. A wild wind appears to have taken the contents of the volcanic eruption, including what looks a bit like a trilobite skeleton, and is flinging them around. So much for sedate, unmoving fossils. White lines in opaque gouache create a sort of exoskeleton for the volcano. 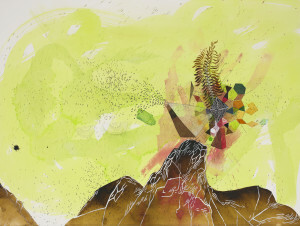 In this piece, Bent has re-embraced the technique of “drawing with paint” but deployed it strategically to bring attention to the solidity of the volcano’s form. The intricate details provide balance to the composition’s wildness—bodies at motion and at rest. PLATE 11. Gala Bent. Flowering Fossil Bed, 2013. Gouache, ink, and graphite on paper. 48 x 36 inches. The Ether and the Mantle also gave Bent an opportunity to create an installation of seven-by-seven-inch drawings that tell a love story in the form of a periodic table [see Plate 13]. She relished the opportunity to come up with titles for each piece, a writing process that feeds into her drawing process. As she works on a drawing, she develops an interplay between word and picture, scribbling phrases alongside the drawing or on the wall of her studio, almost as if she is playing the surrealist game Exquisite Corpse with herself. Phrases work their way back into the drawing, suggesting images and new directions. One of those phrases will, eventually, end up as the title. Maybe it’s the fact that Bent finds words useful in her art-making process that seems to give her work such an affinity with poetry. I think particularly of poets who have taken as their subject the intersection of the human and natural worlds. Looking at her work (which has appeared on the cover of literary journals such as Poetry Northwest, Filter, and Rock and Sling) I’m constantly reminded that to enter a wild place is an act of imagination. We imagine, for instance, that pristine mountain peaks are untouched and untouchable by us. We imagine, as we walk down a trail built by humans, that we are entering an uninhabited landscape. 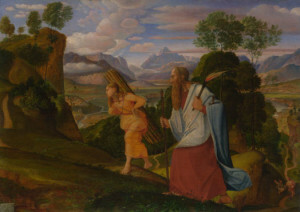 We imagine that an encounter with a wild place is somehow virtuous or consoling, that the wild place brings us goodness that we can carry away with us. PLATE 13. Gala Bent. Covalent, 2013. Gouache, ink, and graphite on paper. 7¼ x 7¼ inches. Wordsworth’s “spontaneous overflow of powerful emotion recollected in tranquility” is presented here in its simplest form, translated into verse. An element in the outward landscape causes a seismic shift in the inward landscape—and that’s the landscape the artist really wants to explore. Look even closer at the surface of Bent’s drawings, and you’ll see evidence of those explorations in fits and starts. 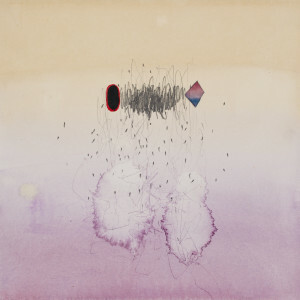 Erased lines proliferate in the background, so that each drawing contains within itself a record of how it was created. Starting each drawing as a tabula rasa, she likens drawing to praying. “It’s a vulnerable place to be,” she says. 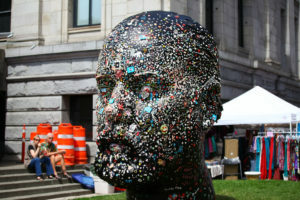 “The process of making art for me is most certainly meditative, contemplative. It’s not prescriptive or instructive. 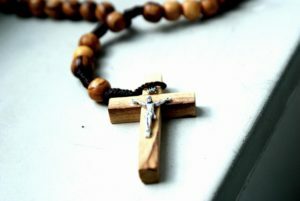 Everything that I do can be read through that lens, and hopefully everything I do can be read without that lens as well. Current structures under consideration in her studio include tangled threads, folded paper, and interlocking wood puzzles, all visible on her blog Drifts and Scatters, where she posts images and reflections about the art-making process. A drawing that throbs with its own reckoning, Tell-Tale-Heart-style. A drawing that breathes through its teeth, makes bad jokes and laughs at itself. That apologizes too often and second-guesses its intentions. Its lines are halting and unsure. It smells like milk and garlic…. A drawing that rumbles like thunder, rimmed with trembling light and shivering in the sudden cold. Rivulets, downpours, wash-outs, sinkholes…. A drawing that gets swallowed up by the earth when it opens up, finally. Rich loam and dark fragrance. Unopened seeds and insect eggs. Wandering roots like hair. As Bent’s body of work continues to evolve, those roots grow deeper. I’m eager to see what springs up from them next.